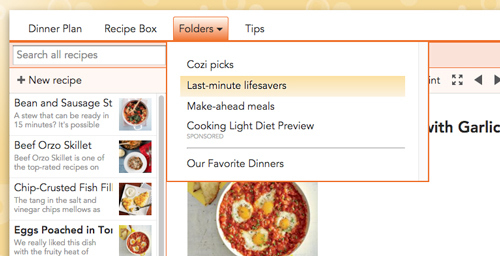 Cozi Recipe Box makes it easy to plan meals, store recipes and let the whole family know what’s for dinner. Cozi editors collect our favorite recipes into Folders, which you can add to your Recipe Box. These collections are updated periodically – so if you see a recipe you like, be sure to save it! In Recipe Box, click Folders. The dropdown menu will display Cozi-curated folders, as well as your own folders. Select a folder to view the recipes in that collection. If you want to save a recipe, click Add to Recipe Box. 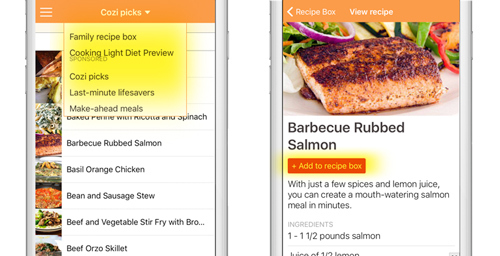 In Recipe Box, tap the top dropdown menu to display your recipe folders. The menu will show Cozi-curated folders, as well as your own folders. Select a folder to view the recipes in that collection. 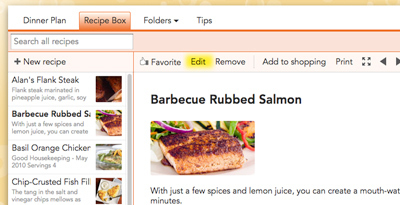 Place the “Add to Cozi Meals” button on your toolbar to add recipes from other websites to your Recipe Box. To get the button on your toolbar, follow the instructions for your browser. Firefox: Right click on this link: Add to Cozi Meals, and choose “Bookmark This Link”. Internet Explorer: Right click on this link: Add to Cozi Meals, and choose “Add to Favorites”. (If you get a security warning, say Yes.) In the Add a Favorite dialog, choose Favorites Bar in the “Create In” field. Use one of the ways described below to quickly add recipe data (ingredients, prep steps, and even recipe images) straight into your Cozi Recipe Box from other sites. When you find a recipe you like, tap the Share button in Safari. Swipe through the apps (on top row), and tap More. Turn on Cozi Recipe and tap Done. Tap the Cozi icon to save the recipe. When you find a recipe you like, tap the Menu button in Chrome. 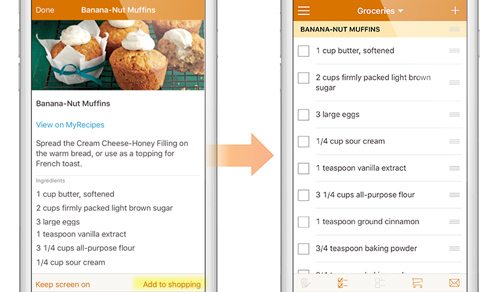 To add a recipe from a page on the web, you can also copy the page URL, open Recipe Box in the Cozi app, and tap “+” in the upper right hand corner. From there, paste the URL into the Recipe URL field and tap “Save.” Voila! You will see the full recipe. In Recipe Box, select the recipe you’d like to edit. Click Edit, make your changes, then click Save. In Recipe Box, select the recipe you’d like to edit. Tap Edit, make your changes, then tap Save. To create a meal plan, go to Meals, then click Dinner Plan. 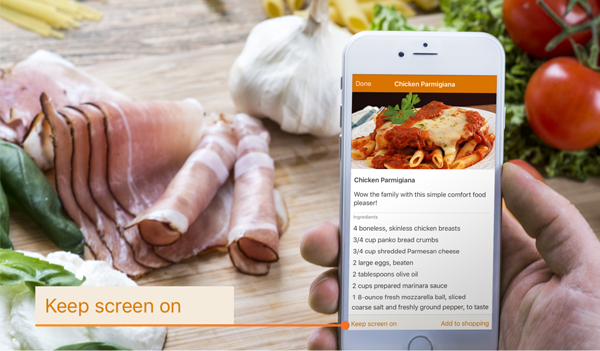 Drag and drop recipes into your plan, and move recipes from one day to another. 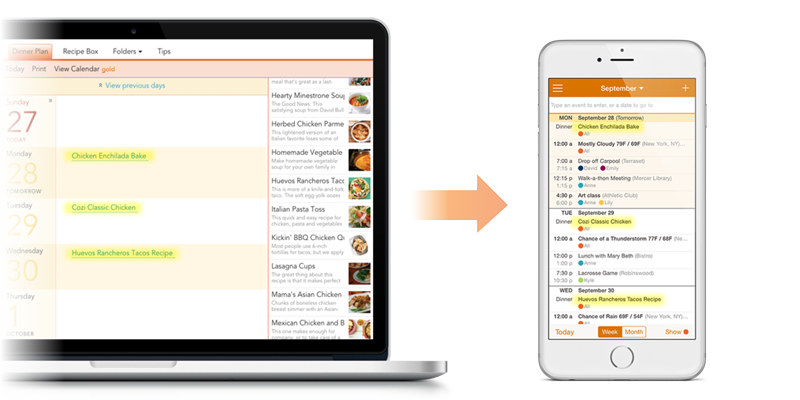 Your meal plan will now be visible in your shared Calendar. No more questions about what’s for dinner! While viewing the recipe you’d like to add to your calendar, tap the Add to Calendar icon in the bottom right corner. Select the date and meal to which you’d like to assign the recipe. Voila! The recipe is now visible on that day on your calendar. While viewing the recipe you’d like to add to your calendar, tap the Options icon in the upper right corner and choose for which meal you’d like to schedule the recipe. Select the date on the calendar to which you’d like to assign the recipe. 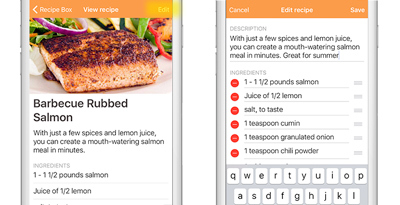 When viewing a recipe, tap Cooking Mode (iOS) or the sun icon (Android). Your screen will stay on (not dim and turn off from inactivity) so you can prepare dinner without touching your device with messy fingers! 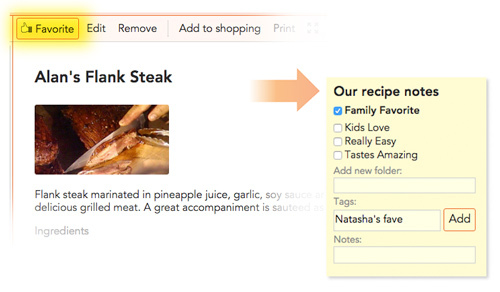 You can add notes and tags to any recipe in your Recipe Box by clicking “Favorite”. This information is searchable, making it even easier to find a favorite recipe.